Some things in life are below-surface niggles. All manner of body and appearance issues can quietly eat away at our wellbeing and confidence. In the recent past, problems like persistent pimples, wrinkles, skin tags, unwanted neck fat or unsightly veins have been viewed as unchangeable destinies. That’s where lives can take a turn for the worse. The clinic has a great track record treating medical issues that may not be visible, but which negatively impact lives. Jenny says Transform’s clinicians have successfully laser-treated problems as wide-ranging as stress incontinence, vaginal atrophy, and snoring. A well-respected medical destination for two decades, Transform’s clinical work has made many people contented, Jenny says. “People come in with conditions or features which can make them very unhappy and leave our building smiling. Some of our clients who visited us in the 1990s continue to return to see us to this day,” she adds. 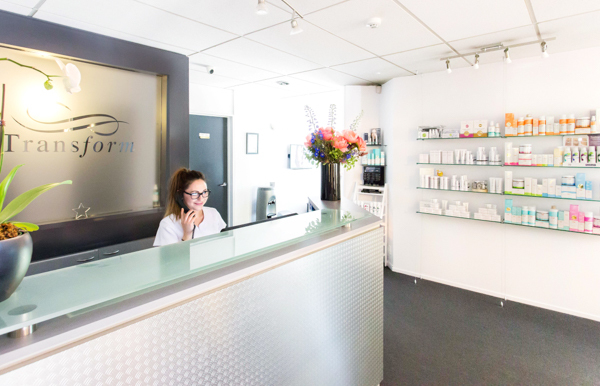 Underpinning all of the medical and cosmetic procedures here is a strong, highly experienced professional team with a doctor, five registered nurses and two beauty therapists. Working in concert, they offer completely confidential expert advice and can treat “just about anything,” Jenny says. For instance, fungal skin infections in toenails are successfully dealt-to by laser technology. Or if skin spots could be moles requiring a health check prior to another procedure, Transform Clinic is a sensible choice. “We do mole checking. We also remove moles, skin tags and other dermal lesions,” Jenny says. Jenny says the clinic nurses and therapists continue to offer free initial half-hour consultations, which is actually a great place to start for all types of health and appearance treatment advice. Transform clinic sees people of all ages and all skin conditions. The psychological side of such conditions is every bit as important, Jenny believes, and she loves seeing clients recover their good spirits in tandem with their physical transformations.